YEKATERINBURG, July 17. /TASS/. 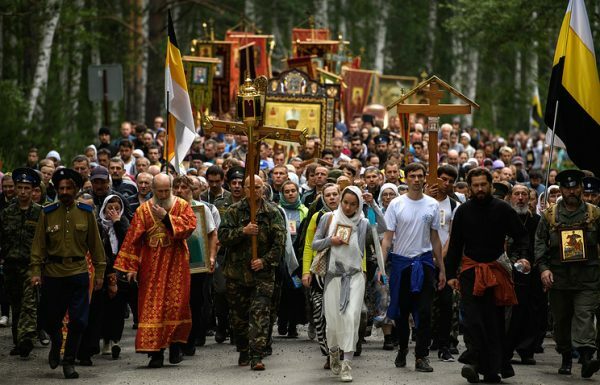 Tens of thousands of pilgrims walked more than 20 kilometers in an overnight procession in the Urals to honor the memory of the last Russian Tsar Nicholas II and his family who were killed on July 17, 1918. The procession, which began at the Church on the Blood in Yekaterinburg and ended at a monastery in the Sverdlovsk Region, was held as part of an international festival of the Orthodox culture “Tsar Days,” Bishop Yevgeny of the Yekaterinburg eparchy told reporters. Delegations from Kazakhstan, Uzbekistan, New Zealand and also Grand Duchess Olga Kulikovskaya-Romanova and MP of the lower house, the State Duma, and former prosecutor of Crimea Natalya Poklonskaya took part in the procession. “This is a duty and great honor for me to be here tonight. Each year the number of people (participants of the procession) grows by some tens of thousands. This is a river of people, this is love that cannot be portrayed by actors, and impossible to falsify…this is love that lives in the souls and hearts for our saint monarch, for our motherland,” Poklonskaya explained. Tsar Nicholas II, who abdicated his throne on March 2, 1917, together with his family were executed by a firing squad in the Ipatyev House’s basement in Yekaterinburg overnight from July 16 to July 17, 1918, following a resolution by the Urals Soviet of Workers’ and Peasants’ Deputies that was controlled by the Bolsheviks. The Russian Orthodox Church canonized Tsar Nicholas, Tsarina Alexandra, Crown Prince Alexis, and Princesses Olga, Tatyana, Maria, and Anastasia in 2000 as New Martyrs for Christ.